Safely store and organise your tool batteries - mount on walls in the workshop, panels in the van, in cases, under shelves or on a belt. Batteries 'click' in and can be held at any angle, easily release with a press of the button, just like when using with a tool. Conveniently and neatly wall mount your battery chargers. These are 3D printed mounts that have been designed to fit and firmly grip the chargers using their casing. Simply fix the mounts to your wall or panel using suitable fixings either with the 4 holes or key-ways, align and firmly press the charger into the mount. Perfect for vans and workshops, keep chargers organised and within easy reach. 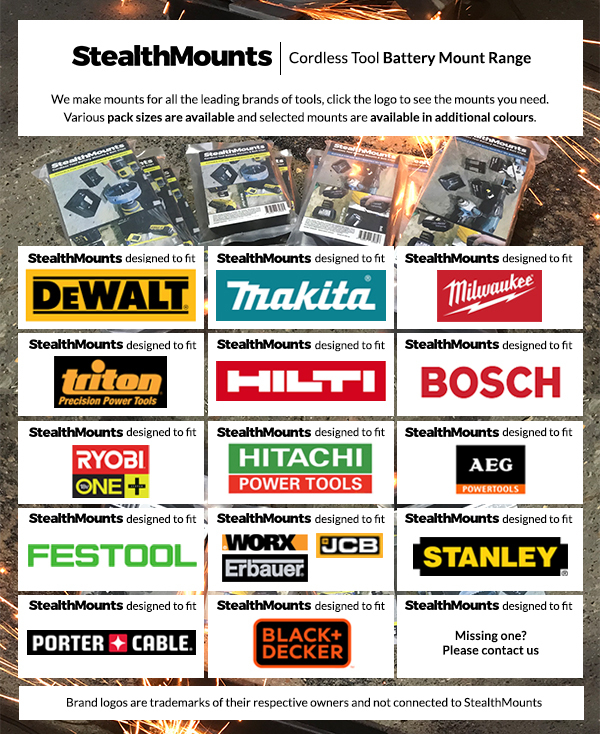 StealthMounts only - no fixings, tools or accessories included, suitable (common) screws required for wall/panel mounting. 10 pack is 2x “5 pack”. The maximum liability for items sold (such as mounts) is the cost of the mount. A refund will be provided in the event that a mount is found to suffer from a manufacturing defect reported within a period of 30 days. No liability is accepted for damage to equipment or other property as a result of using or misusing our mounts. Ensure mounts are properly fitted and verify they are firm, strong and correctly used prior to each use. Do not fit or use mounts with excessive force. Mounts are plastic parts which will wear and degrade over time and may not withstand hard impact or excessively heavy use. Any disputes must be brought within England. Hassle Free Returns: Product may be returned within 14 days of purchase in as new condition at the buyers cost, a refund will then be provided less P&P.